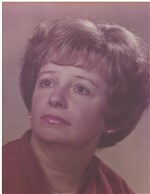 Delores Swords Exley, 83, of Savannah, Georgia and widow of Herman Joseph Exley, died Tuesday night, April 2, 2019, at Bryan County Health and Rehabilitation with her family by her side and under the care of Spanish Oaks Hospice. Born in Savannah, Georgia, she was a daughter of the late Stewart Marvin Swords and the late Stella Mae Cooler Swords. Mrs. Exley was a member of Immanuel Baptist Church. She was a former bookkeeper for the Manger Hotel-Motor Inns chain. In addition to her husband and parents, she was preceded in death by her brother-in-law, Talmadge Nolan Purcell. Survivors include her sister, Jean Swords Purcell; two nieces, Tammy Hendley and her husband, Chris, and Cynthia Silverio and her husband, Bob; three nephews, Keith Purcell and his wife, Tammie, Philip Courie and his wife, Linda, and Vincent Exley and his wife, Sylvia. The family will receive friends from 10 until12 Saturday at Gamble Funeral Service – 410 Stephenson Avenue. The funeral service will be held at 2 o’clock Saturday afternoon at the graveside, Ebenezer Cemetery at Jerusalem Lutheran Church near Rincon, conducted by the Reverend Jimmy Shupe. Remembrances: Spanish Oaks Hospice – 8510 Whitfield Avenue, Savannah, Georgia 31406.